When it comes to office design, good planning is essential. A good office design improves productivity and contributes to the well-being of your employees. It should reflect your company and how you like to work, both internally and with your customers. Believe it or not, the average adult spends over 50% of their daytime hours in an office. It’s the central part of our day and often the place we spend the most time in. This is why, in addition to functioning well, we want an office design that creates a pleasant and inviting place to spend time in. With some thoughtful planning, you can achieve both… but where do you start? There is a lot of office planning advice out there, but how do you know what will work in your actual office space? One of the best ways to figure that out is with an online office planner. 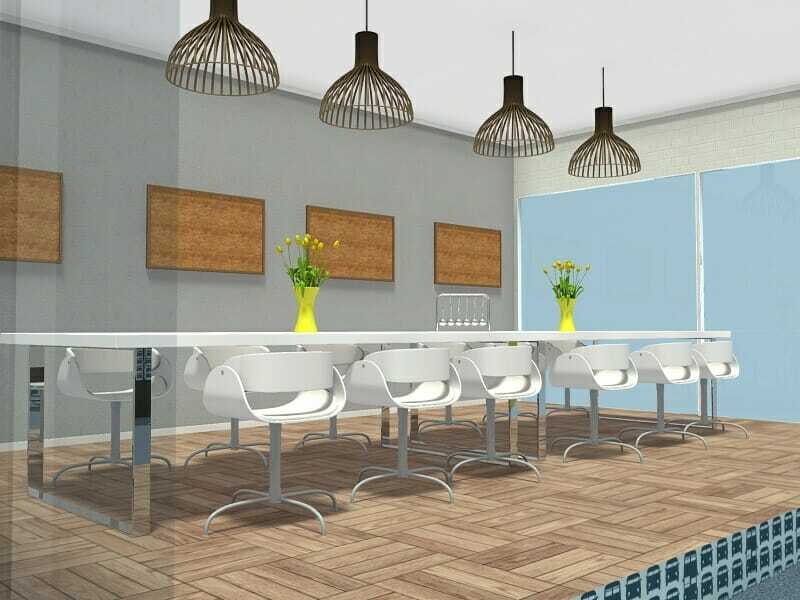 RoomSketcher Home Designer is a great online tool to use for planning your office design. Create layouts, try out different ideas, find furniture and more! Sounds great, right? In truth, office planning can be really challenging, there are lots of different needs to consider and bring together. However, this can be made a lot easier when you can see your ideas and options clearly. All you need is the right tools. With a RoomSketcher Pro subscription you can plan and visualize your office in 3D and create 2D and 3D Floor Plans and 3D Photos of your office design ideas. Unlike other office planners, RoomSketcher Home Designer is easy-to-use and requires no training. 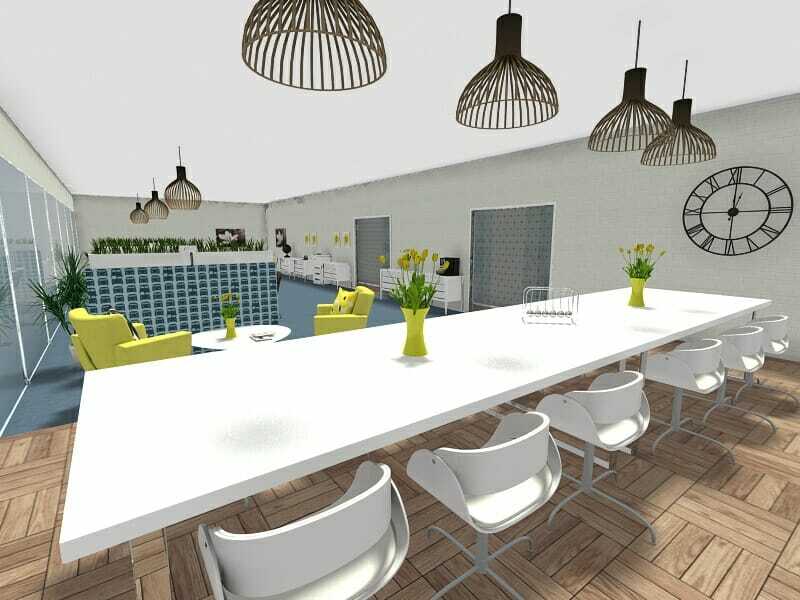 So, you can get started on your office design straight away. Try out different office designs and find solutions that work. Plus, integrated sharing features make it easy for you share the design with other employees, as well as with any contractors and office furniture suppliers you may need. The best way to start an office design is with a floor plan. Floor plans are an important tool to see what will fit in your office space and what won’t. With RoomSketcher Home Designer drawing a floor plan is easy. You can draw your floor plan from scratch or choose a template to start with. Layout your walls, adjust the room sizes and add any windows, doors and stairs with the easy-to-use drag and drop drawing tool. What’s really cool is that while you draw your floor plan, a 3D model of it is being created at the same time. 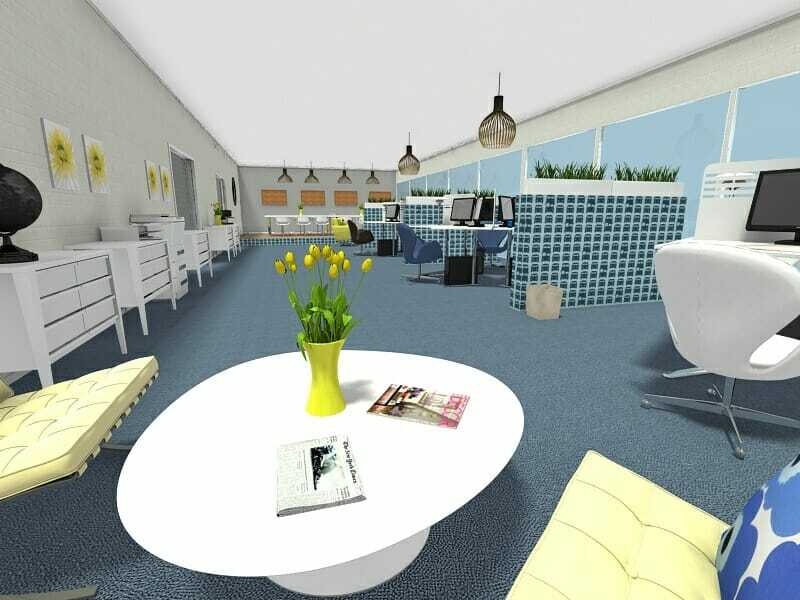 So, you can see how your office design looks in 3D as you go. When office planning, it’s good to create two versions of your floor plan one of the existing floor plan and one with your new design. Having both will help furniture salespeople, suppliers, contractors and movers to see more accurately what the needs are. This will save you time and money when getting estimates. Design Tip: Short on time? Leave the drawing to us. All you need is a sketch or blueprint of your office floor plan and RoomSketcher Floor Plan Services will turn it into a RoomSketcher project for you, with 2D and 3D Floor Plans ready the next business day. There are many different ways of working now that require different types of office layouts – from traditional cellular office layouts to open office or team style layouts. In addition to workstations, there are also many new ways of integrating meeting areas into office layouts that are both casual and formal. To figure out which is best for your office design, you will want to create several different layouts to review and compare. With an online office planner like RoomSketcher Home Designer, creating layout options is easy. Simply add a new level to your project. Your floor plan will be copied over so there is no need to draw again – just click and create your new option. Start by creating basic zones, then add more detail to your office layout as you go. The integrated measurement tools will show your zone sizes and room sizes so that you can layout out your spaces with the proper clearances. With a RoomSketcher Pro subscription you can save your favorite layouts and generate high quality 2D and 3D Floor Plans of them, at the click of a button, to review with your boss and share with your team. Design Tip: When creating your office design don’t forget storage. Storage is often overlooked when planning an office. Having a well thought out plan for your office storage needs will greatly contribute to the success of your design. The RoomSketcher product library has more than 5,000 brand-name and generic products to choose from. Try different styles of desks, meeting tables, task chairs, lounge seating, shelving and more. And don’t forget about lighting! Work stations need task lights and decorative lights are a great way to create focal points in meeting and reception areas. Once you have your office layout, you can add finishes to the floor, walls and ceiling. Just click the Materials button and select a material, such as wood, tile, carpet or concrete. Find your favorites and drag it into place on your floor plan. You can also match paint and other solid colors in RoomSketcher Home Designer using the color picker. OR create custom colors of your own to match your brand or to create a signature look. Design Tip: You can apply finishes on single walls too. This is great way to create accent walls and visual focal points in your office design. 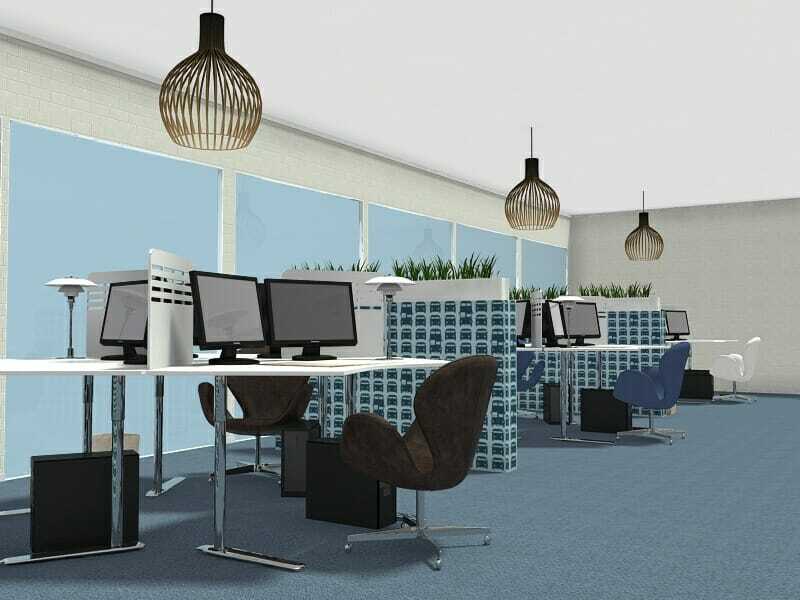 Visualize Your Office Design in 3D! What is really unique about RoomSketcher Home Designer compared to other office planner software, is that you can create amazing 3D images. Take Snapshots of any part of your office design in 3D with the integrated camera tool. Create wide-angle views or zoom-in to view areas in more detail. Save Snapshots to review and compare. With a RoomSketcher Pro subscription, you can upgrade your favorite Snapshots to stunning 3D Photos – perfect for proposals and presentations. In addition, you can view and share your office design in interactive Live 3D. Take an virtual tour of your office design in three exciting ways – fly over your 3D Floor Plan to get a clear overview of the layout, navigate through the space with an avatar or walk through your office design viewing it as if you are actually there! Get a “true” feel for how your office will actually look and feel. There’s no better way to visualize your office design and find solutions that work! You can access RoomSketcher Home Designer easily online. Simply create a free account and sign in to access your project. With a RoomSketcher Free account, you can try out RoomSketcher Home Designer at no cost. When you’re ready for Live 3D and to generate high quality 2D and 3D Floor Plans and 3D Photos, simply upgrade your account to a RoomSketcher Pro subscription. It’s that easy!